Electronics giant Samsung, ever-keen to find new uses for its flat-panel display hardware, has come up with a novel idea. 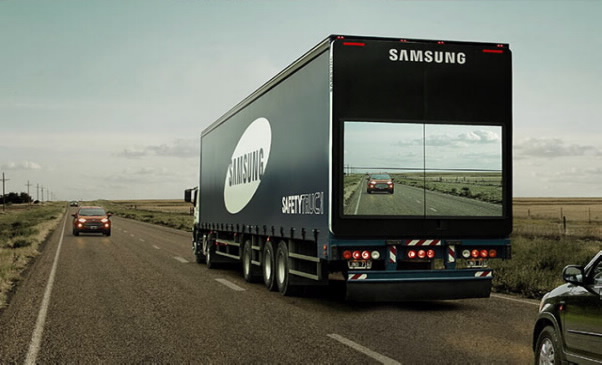 It has developed a truck-based TV system that displays the image as seen from the driver’s cab of the vehicle, and shows the road ahead on four giant TV displays on the rear doors of the truck. A report from Display Daily says that the camera system works just as well at night as during day-light hours, and permits the following vehicles to ‘see’ whether the road ahead is clear. The suggestion is that in many countries where single lane roads are commonplace a huge number of accidents are caused by over-taking drivers failing to fully understand what is happening on the road ahead.